Curious what’s driving Millennial homeownership? Is it marriage or the prospect of a little one crawling around? Nope. Aside from more living space and building equity, dogs are motivating young folks to buy homes. And as a dog lover myself, I’m okay with that. 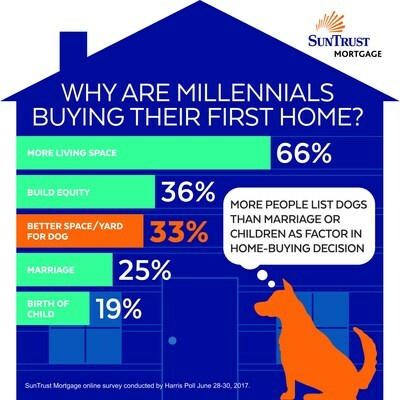 This was discovered in a survey conducted by SunTrust Bank that polled 18 to 36 year olds who recently purchased their first home. Beating out the dogs was the need for more living space, which ranked #1 and was cited by 66% of these Millennial home buyers. It was followed by the desire to build home equity (cited by 36% of buyer-respondents), no surprise given it’s a great way to acquire wealth. Funnily enough, it beat out marriage (25%) and the birth of child (19%) as the other reasons to own a home. For those who hadn’t yet purchased their first home, 42% still said their dog (or desire to have one) was a “key factor” in their plan to buy a property in the future. Unfortunately, homes these days are getting smaller and smaller – well, at least the lots are, which might be bad news for the dogs. 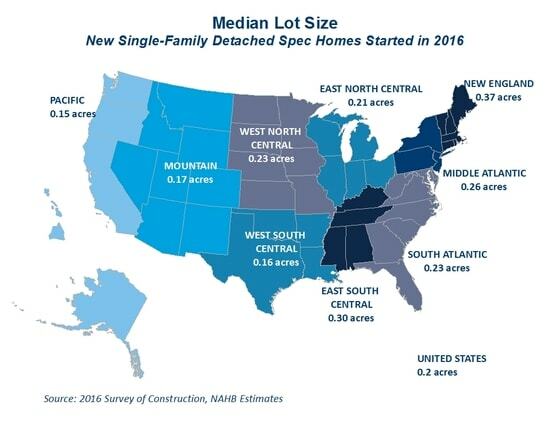 Per the NAHB, the median lot size of a newly constructed single-family detached home sold in 2016 fell to just 8,562 square feet. That’s about one-fifth of an acre. It also marks a new record low and a small decline since 2015, according to the Census Bureau’s Survey of Construction (SOC). This isn’t surprising given the premium for space nowadays, especially as buyers cluster in higher-density areas as opposed to the suburbs. However, it depends where you’re buying a home. In the Northeast, strict zoning laws continue to contribute to the largest lots in the nation. Meanwhile, lots are tiny by comparison on the Pacific coast thanks to that darn ocean right there. Personally, I prefer a large lot because it gives you more space, obviously, and allows you to do more with your property, if you so desire. This can lead to improved privacy, and less high-fiving your neighbor out the window. Additionally, it means you might be able to build upon your property if you want to add an addition in the future. The extra space might also provide for a garden, a nice outdoor office space (in a fancy shed), or a little casita for the in-laws. The possibilities are endless, really. If your lot is basically all house, which is often the case these days as home builders squeeze every square foot, you’re basically stuck with what you get. The good news is you’ll have less upkeep and maintenance to worry about, which can save you money. You could even save on your water bill. Here in Southern California, a lot of homeowners are pulling out their grass and putting in the fake stuff to be more environmentally conscious. And also reduce costs. So a big lot isn’t always ideal for everyone, especially those who aren’t very outdoorsy, or looking to spend hundreds a month on their sprinklers. But if you are up to the task, a home on a big lot could pay dividends over time, especially as land becomes less and less available. The average Millennial primary borrower (29.4-year-old) in August took out a conventional mortgage loan for $185,919 to purchase a home valued at $223,882, per Ellie Mae. That’s an LTV of around 83%. This buyer also had an average FICO score of 724 and received a mortgage rate of 4.211% on a 30-year fixed. It took 44 days to close, and 64% of these primary borrowers were male, while 52% were married. It’s unclear how many own dogs. Read more: 10 reasons to buy a home other than for the investment.